Like most antelope, the majority of the beira's activity occurs in the morning and evening, while at midday it rests. Beira are exceptionally wary, and are alerted to the slightest disturbance by their large ears. When startled they move off with great speed across the loose stones, bounding from rock to rock in a goat-like fashion on steeper, more secure territory. Beira are adapted to a dry habitat, obtaining all needed water from its food supply. Beira is from behra, the Somali name for this antelope. Dorkas (Greek) a gazelle or antelope; tragos (Greek) a he-goat. Megas (Greek) big; ous (Greek), genitive otos, the ear: a reference to the huge ears. The coarse coat is a reddish grey on top, while the underparts are white. Between these sections of colour is a dark band which extends along each side from the elbow to the rear leg. 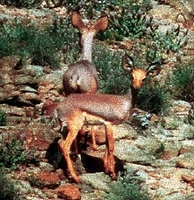 The fawn-coloured legs are exceedingly long and slender. The yellowish red head is accentuated with black eyelids and white rings around the eyes. However, the most prominent feature of the beira is its ears, which grow 15 cm / 6 inches long and 7.5 cm / 3 inches wide. The insides of the ears are covered with a layer of white hair. The tail is bushy. The horns, borne only by males, are straight spikes which rise vertically from near the sides of the ears and grow 7.5-10 cm / 3-4 inches long. 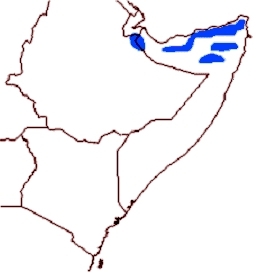 This species is present only in Somalia and marginally in adjacent parts of Ethiopia and in Djibouti (East, 1996; Wilson & Reeder, 1993). A distribution map was obtained by joining three country maps in East (1988), and revised by Dr. R. East ( 23 June ‘97 ), who suggested marking the entire range as "possible presence" as shown in Fig. The species appears to be restricted to arid, stony hills and mountains. Habitat preferences in relation to vegetation communities are poorly known (East, 1988; Stuart & Stuart, 1997; Kingdon, 1997).